Call me anything, except ‘sir’, and then we’ll talk. It’s not often that we come across such humility amongst such successful people. 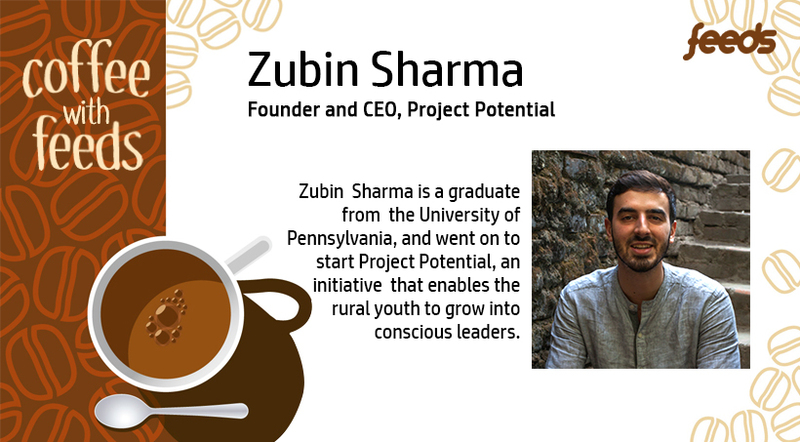 “People everywhere have potential and this potential can be used to create change.” was the driving force behind Zubin Sharma to start Project Potential. A graduate from the University of Pennsylvania, his short stint with an NGO in Bihar helped him analyse the current situation and lay the foundation for his own initiatives. Invited to speak at the orientation programme, Zubin didn’t have to make an effort to keep the crown captivated for over an hour, and Team Feeds following that. What does your family think about what you’re doing here? The reason I’m here is because of my parents. My dad had always wanted to do something for the society and had moved to the US with the hope of equipping himself with the right skills but eventually settled there. And my mother, one of the nicest persons I’ve seen picks up homeless people on the way, gives them food and makes them feel loved. Having been brought up in such an environment, I had all the support they could give me. Have you ever considered teaming up with organizations like Teach for India for providing education in places that you still haven’t reached out to? Project Potential isn’t just focussed on education. While Teach for India build leaders for the education scenario in this country, we’re trying to build leaders to improve the overall conditions of the villages here. We already have partnered with organizations like Pratham, and teach kids to become proficient in reading. We also are in collaboration with BASICS, to provide livelihood opportunities for the villagers and are still looking for collaborations in the health sector. We want to equip villages with visionaries. Are you looking at an expansion of the organization? Yes. We need people who can gather all their training expertise and compile it into one manual, making it easier for everyone else. We currently employ around 70 people and are looking for people who can set up these projects in other parts of the country, like the north east or down south. How important is the role of technology in education? Are you looking into this aspect too? Before starting anything new, we first establish an objective and look for the most efficient means to achieve this. If technology can serve the purpose, then we go for it. But in our present situation, we’re looking for partnerships for the same. However, we have started arranging computer classes regularly, for a start. Healthcare in India is expensive. How are the villagers able to afford this? By healthcare, we do not mean extravagant facilities. Certain micronutrients (in food form) that are essential for kids, are provided at relatively cheaper prices. Again, we’re looking for collaborations in this sector too so we can provide better facilities at affordable prices. When you say providing livelihoods, what exactly do you mean? Usually, we try to improve their day-to-day consumption. For farmers, we introduce them to seed providers or to micro financiers. For the women, we help them form self-help groups to gain an overview of the financial world. Given that you started this off all on your own, would you call yourself an entrepreneur? No. I would like to think of myself as a man with a mission than an entrepreneur. What keeps you going when corporations turn you down? I was rejected by over 100 corporations before 17 of them shortlisted me. For a normal person, this would be a major deterrent. But for me, it was always about giving my best and living by my values. And I always believed that that’s what matters. Apart from this, I meditate to keep myself calm, and run regularly. I also write as it helps me analyse the situation better. Learn more about Project Potential here.